Tomorrow families will celebrate the 4th of July with friends and families. Many of these celebrations will include fireworks… whether watching as part of a show or performing your own personal one. While they are beautiful and fun, fireworks also pose dangers. 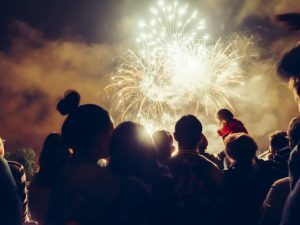 According to a 2012 U.S. Consumer Products Safety Commission study, in the weeks around July 4, an average of 200 people per day visit emergency rooms due to fireworks-related injuries. Twenty-nine percent of these injuries are to children ages 14 and under. Eleven percent of injuries are related to sparklers, and eight percent are related to bottle rockets. Fortunately, there are steps families can take to keep all members safe while enjoying this special time. The safest thing to do is to leave the fireworks to the professionals. However, if your family can’t live without a show at home, there are ways to keep everyone safe and happy. Fireworks are safest left to the pros. Check local and state laws to make sure fireworks are legal where you live. Wear clothing that fits close to the body, avoiding anything loose-fitting. Have a bucket of water and/or a fire extinguisher nearby. If a firework fails to go off, extinguish it immediately. Don’t try to re-light it or to investigate the problem while the firework is still lit. Stand several feet back from fireworks that have been lit. Closely supervise children around fireworks. Do not place lit fireworks in containers. Keep your body away from fireworks when lighting them, and never point fireworks towards someone else. Store fireworks in a cool, dry place, out of the reach of children. Protect your eyes and face! Many eye injuries occur every year from firework accidents. Consider the use of safety glasses. Remember that alcohol and fireworks don’t mix. Let children help make decorations for the day’s activities. 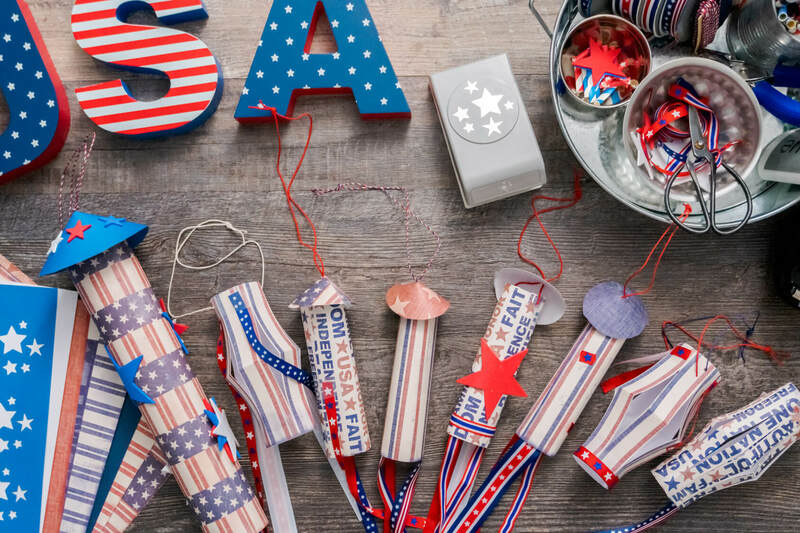 Letting children make decorations for the 4th is a great alternative to fireworks. Let children help plan the meal and cook. Remember–what children make, they are more likely to eat! Let children make crafts or decorate special clothing for the day. Next, consider providing some safer, more kid-friendly versions of the traditional home fireworks show. While the sounds made by fireworks may be fun for some members of the family, others, especially young children, may find them frightening. When you provide new, fun ways to create kid-friendly noise and pretty lights, all members of the family can enjoy the holiday. Families can play or sing patriotic songs, and make noises as a part of games and other events. Look around the house for common items that make noises, such as balloons to pop, kitchen ware to bang, toy or real musical instrument, bags to inflate and pop…anything you can find that can make a sound. Many party stores also offer items that make noises, such as horns, party favors, etc. You can also make your own noise-making items, like this fun idea seen on Pinterest. Many parents and grandparents view sparklers as “safe” fireworks. However, sparklers burn at 1200 degrees F: hot enough to melt gold. Sparklers burn at 1200 degrees… hot enough to met gold. Use glow-in-the dark products to mimic the colors of fireworks. Many different types of products are available, including sticks, glow ropes, glow jewelry, and more. Wrap the ends of flashlights in colored paper and put on a show. Purchase or make special lights or lanterns using LED lights or Christmas lights. Capture fireflies or lightning bugs in a jar and watch them perform their own show. Once the fun is over, however, remember to release them back to nature! 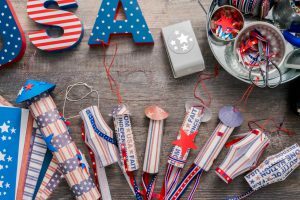 Check out the Safe Family Fourth of July Pinterest board for ideas for kids’ crafts and safe and fun light and sound activities. Your family may find they actually enjoy these new traditions more than the old. Fireworks are beautiful and a big part of celebrations for many. By planning ahead and knowing your options, you can have a safe and enjoyable Fourth of July with family and friends. SafeKids Worldwide offers safety tips for parents and caregivers. U.S. Consumer Product Safety Commission, Fireworks Information Center. 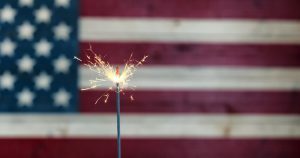 Information about including sparkler and fireworks safety tips, videos and information. National Fire Protection Association: Fireworks. Offers safety tips and videos, and injury facts on fireworks safety.